HDOT is working to expedite flood repairs to Kuhio Highway on the north shore of Kauai following the historic flood event on April 14, 2018. This page consolidates information on the repairs, convoy schedule, and other details relating to the repairs and the information will be updated as quickly as possible. Convoy Schedule – Link to the current convoy schedule. 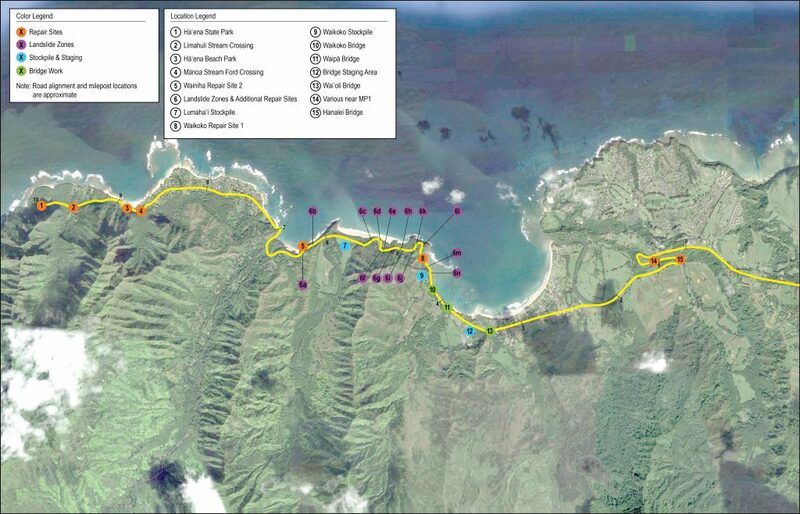 Note: this does not include the schedule for the shuttle operated by the Hanalei Colony Resort. Kauai County’s April Flood Page – Link to the Kauai Emergency Management Agency page with information on how to get a resident placard, work pass, or shuttle pass for access to Wainiha and Haena. Project Status (as of 4/5/19) – View the table below for a list of HDOT repair projects and current progress. 1 Route 650, MP 10 at Kee State Park Repair road washout. Reviewing design options. 2 Route 560, MP 9.7 at Kē‘ē State Park Reconstruct Kē‘ē State Park parking lot. Construction nearing completion. 3 Route 560, MP 9.55 at Limahuli Stream Crossing Repair concrete section lost in flooding. Resurface ford crossing. Design Completed. Permits secured March 22. Precast panels fabrication upcoming. Mobilization estimated to begin April 22. 4 Route 560, MP 8.7 at Haena Beach Park Repair roadway shoulder. Pending. 5 Route 560, MP 8.76 at Manoa Stream Ford Crossing near Haena Beach Park Repair entire crossing. Design Completed. Permits secured March 22. Precast panels fabrication ongoing. Mobilization started April 1. 6 Route 560, MP 6.5 Repair Site 2 (road washout area) Debris removal, slope wall installation including soil nails, foot of slope revetment, guardrail/sign replacement, pavement repair. Soil nail, shotcrete, texture and finish work has been completed. Revetment completed. CRM wall completed. 7 Route 560, 15 or more locations between MP 6.5 and 4.4 (Land slide zones) Debris removal, slope scaling, slope stabilization, guardrail replacements, pavement repairs. The majority of debris removal and slope scaling complete. Nearing completion of the slope stabilization in two most critical slopes (Slides A & B). 8 Slides A & B Slope scaling and reinforcement. For Slide A, excavation and soil nail anchoring completed. Wire mesh installation and drainage swale work ongoing. For Slide B, excavation and soil nail anchoring completed. Wire mesh installation at slide B nearing completion. Drainage swales work is ongoing. Route 560, MP 6.3 Repair Site 3 Roadway stabilization area. Debris removal, slope wall installation including soil nails, foot of slope revetment, guardrail/sign replacement, pavement repair. Soil nail, reinforcement, and shotcrete placement has been completed. Paving, and guardrail to be scheduled. 10 Route 560, MP 6.2 Repair Site 4 Roadway stabilization area. Debris removal, slope wall installation including soil nails, foot of slope revetment, guardrail/sign replacement, pavement repair. Soil nail, shotcrete work, texture and finish work has been completed. Paving complete. Guardrail installation started April 1. 11 Route 560, Repair Site 5 Slope reinforcement. Shotcrete work ongoing. 12 Route 560, Repair Site 6 Slope reinforcement Soil nail, shotcrete, texture and staining completed. 13 Route 560, MP 5.8 Lumahai Stockpile area Stockpiles are being maintained and erosion control measures are being implemented. 14 Route 560, MP 4.5 Repair Site 1 (road washout area) Roadway stabilization area. Debris removal, slope wall installation including soil nails, foot of slope revetment, guardrail/sign replacement, pavement repair Soil nail, shotcrete work, texture and finish work has been completed. Paving and guardrail to be scheduled. 15 Route 560, MP 4.4 Waikoko Stockpile area Stockpiles are being maintained and erosion control measures are being implemented. 16 Waikoko Bridge Replace existing bridge Drilling for makai micropiles complete. Temporary waterline relocation ongoing. Mauka casings install upcoming. Makai abutment micropile caps upcoming. 17 Waipa Bridge Replace existing bridge Drilling for makai micropiles ongoing. Temporary waterline relocation ongoing. Mauka casings install upcoming. Makai abutment micropile caps upcoming. 18 Route 560, MP 3.7 Staging area Staging area currently in use. 19 Waioli Bridge Rehabilitate existing bridge, remove debris from under bridge Pier footing work is ongoing. VESLMC (Latex Modified Concrete) topping on bridge deck complete. Construct bridge approaches upcoming. 20 Route 560, MP 1 Debris removal, slope scaling, guardrail replacements, minor pavement repair (April). Slope stabilization (Lane). Repairs from April Flood completed. Positive protection barrier complete. 24 Wailua Bridge Debris removal from river under bridge (April). Adding scour protection post Lane. Installation of scour protection countermeasures complete. 25 Kapaa Bridge Adding scour protection. Installation of scour protection countermeasures complete.